“Chai” is a Russian word for “tea”but how would Thais know? Monthiya Narongchai of Mae Hong Son took first prize in the Tai Yai beauty contest Daughter of the Peacock of Dehong on April 13. 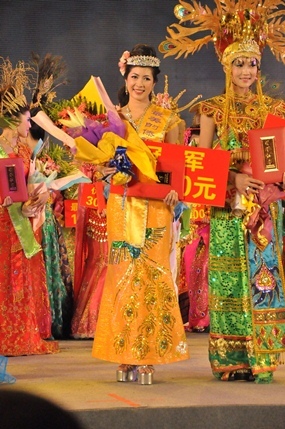 A Tai Yai woman from Mae Hong Son won the title of Daughter of the Peacock of Dehong in Yunnan, China on April 13, 2011. Ms. Monthiya Narongchai, who is Miss Mae Hong Son won the first prize at the beauty contest out of 113 contestants representing China, Myanmar and Thailand in this regional beauty contest for Tai Yai people. The event coincides with the International Songkran Festival celebrated in Yunnan, or the Dehong International Water Sprinkling Festival. Ms. Monthiya received a diamond crown and cash of 50,000 yuan or 250,000 Baht. She travelled to China for the contest with Mae Hong Son Governor Kamthorn Thavornsatit and other officials from Chiang Mai, Mae Hong son and Tak. There were all invited by the Governor of Dehong to participate in the beauty contest, to help develop good relations of between Dehong and Thailand. The Durian World Expo will be held in Chanthaburi at the Triangle Cheay Farm Public Park throughout May. 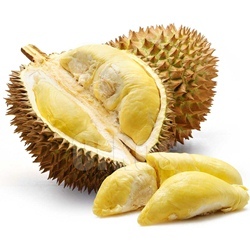 Durian lovers everywhere acknowledge the superior Chanthaburi durians and flock to the province for activities that include a fruit contest, raft contest, fruit eating contest and of course a beauty contest. Shooting rockets into the air is believed to help bring the rains after the hot season. In a country where agriculture and farming sustains the livelihood of over 70 per cent of the population, the festivals and ceremonies associated with a bountiful harvest are central elements of the way of life in the rural communities. Agricultural productivity and abundance are the principle objectives of both the royal as well as the folk traditions. These rituals performed on auspicious dates in the sixth lunar month (approximately in May) signal the beginning of the planting season. 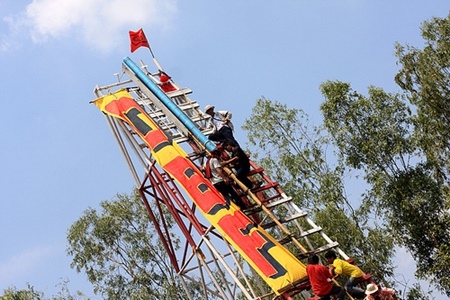 Born of the traditional beliefs of the Isan people, the sprightly "Bun Bang Fai" Rocket Festival, the most celebrated of Isan's merit-making rituals, has been strictly observed by the residents of Isan for generations and is essentially an annual ritual to ensure that the seasonal rains fall at the appropriate time in the planting cycle. In this process, Buddhist merit-making traditions are also observed and reinforced. Highlights of the annual Bun Bang Fai celebrations include a procession of old-style rockets mounted on traditional carts, a beauty pageant, cheerleader contests, and a traditional 'Palaeng' I-san style dinner. The festival which is held over a period of three days strengthens community spirit. The first day known as "Wan Sook Dib" features lively processions as rocket teams transport the rockets in a procession and perform a ritual to pay homage to Chao Pu, the spirit of the city pillar. Each is escorted by a colourful dance troupe. The second day is the rocket procession day. Modern-day rockets are mounted on vehicles or traditional carts to be drawn in the parade. The "Bang Fai" rockets come in different sizes. For example, the Bang Fai Kilo is packed with one kilogram of nitrate, while the Bang Fai Meun - 12 kilograms, and the Bang Fai Saen - 120 kilograms of nitrate. The rocket-making technicians play a vital role in deciding the right amount of nitrate to be mixed with the charcoal. With the wrong formula, a rocket could blow up prematurely before it is launched high into the sky. The rocket cylinders are usually made from the bottom half of the bamboo. It is also a day for the ordination of novices. Festive celebrations follow merit-making rituals. Dance, music, song and revelry are integral elements of the processions as the parade of beautifully decorated rockets wind their way through the village on their way to the temple offering an opportunity for the residents and visitors to admire the impressive works of art. The rockets are finally launched on the third day in which various rocket contests are held. With the launch of the rockets, predictions are made with regard to the fortunes of the coming harvest. The Rocket Festival in Yasothon Province is spectacular and provides a tremendous opportunity to experience Isan-style festive fun. The Rocket Festival stems from the belief that when this merit-making ceremony is held, gods and spirits will reciprocate with seasonal rain and a bountiful harvest. The Rocket Festival is May 11- 15, 2011.